Across Planet Barbecue you’ll find “fire eaters” — people for whom no chicken wing or any dish for that matter can be too fiery. (You may even be one of them!) They’re easy to spot—even at breakfast: They douse their eggs with Sriracha or other hot sauce, then slice fresh jalapenos on top for good measure. Talk at their table often turns to Scovilles—the unit of measure for a chile pepper’s relative heat. Of course, one-ups-manship enters the conversation — i.e., have you tried India’s bhut jolokia (“ghost pepper”)? Ya, no big deal — have YOU tried Trinidad’s Moruga Scorpion? Deadly, man …. Well, wherever there’s smoke, there’s fire. I always try to satisfy gustatory pyromaniacs with a few incendiary dishes. This year, you have to try Fire-Eater Chicken Wings, electrified with a triple-blast of heat in the form of cayenne pepper, fresh red jalapenos, and a generous dose of hot sauce. With it, you’ll please those pyro palates coming to your next cookout. Just be sure to have plenty of cold beer on hand (or milk!) to put out the fires. Here are a few of my favorites from my Planet Barbecue — and I have the blistered taste buds to prove it. Piri-piri chicken wings (South Africa): Marinated in fiery piri-piri chili sauce, then grilled and glazed with butter, lemon juice, garlic, cilantro, and more piri-piri sauce. Samba wings: Lime- and garlic-marinated, then spit-roasted at churrascarias (Brazilian rotisserie restaurants). Served with molho da companha (fiery chili-tomato salsa). 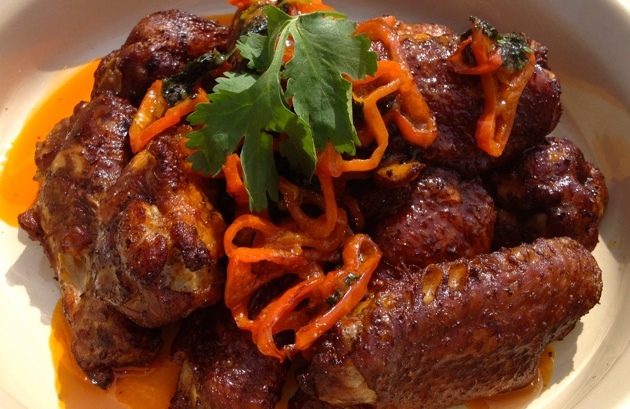 Saigon wings: Grilled wings invigorated with lemongrass and ginger. Jamaican jerk wings: Slathered with scotch bonnet-chili based jerk seasoning and smoke-roasted over allspice wood. North Americans are accustomed to pre-cut wings that have been separated at the joints into “drumettes” and “flats”, often sold separately. It takes only a few minutes to do this yourself: Lay the wings flat on a cutting board, and using a chef’s knife, cut through the two knobby, cartilaginous joints in each. Discard the bony wing tips or freeze them for stock. In Asian and other food cultures, wings are often grilled whole, stretched out on bamboo skewers or on spits to maximize their exposure to smoke and fire. You can also corral wings in a rotisserie basket, or pinion them in a grill basket such as my Flexi-Basket or All-Purpose Grill Basket. Advantage of the basket — you turn it, not multiple wings. And you avoid singeing the hair off your forearms. Click here to enter the Barbecue Bible July 4th Sweepstakes!